Honeysuckle is an attractive vine that thrives in almost any location, as long as it gets the right care. During summer, the vines grow and bloom to produce unique, very fragrant flowers. During winter, though, honeysuckle is somewhat different. According to Green Growing Life, honeysuckle vines are quick growing, tolerant and nearly indestructible. They can grow to 20 feet in height and bloom in shades of pink, yellow, orange and white. 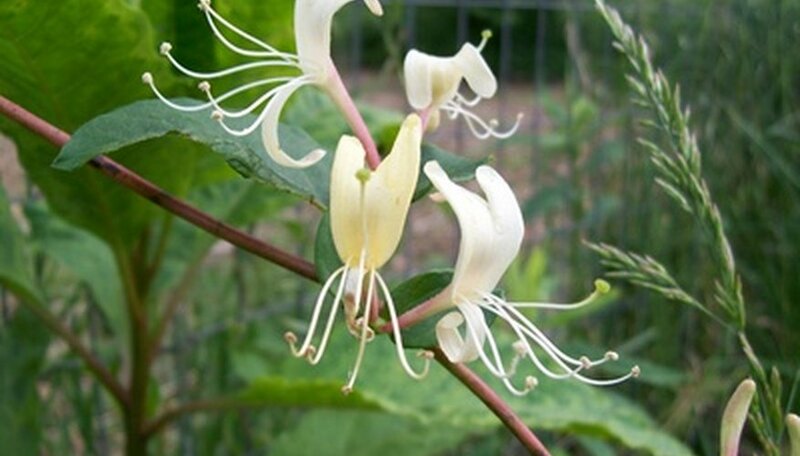 According to the Garden Helper, honeysuckle hardiness depends largely on type. Some types are extremely hardy to cold, while others aren't. Vining forms like L. sempervirens tend to be more cold sensitive, while shrub versions like L. fragrantissima are hardier. All honeysuckle grows best in U.S. Department of Agriculture plant hardiness zones 9 and 10, but hardy varieties are hardy to 20 degrees F, or zone 8. Gardeners who live in cooler zones should plant hardier honeysuckle for best growing success. According to Flower and Garden Tips, some varieties of honeysuckle (Cape honeysuckle) are evergreen, and retain their bright green leaves through winter. Non-evergreen varieties (Lonicera halliana) drop their flowers and leaves in fall, but maintain their strong woody stems through winter to rebloom in spring. Flower and Garden Tips states that honeysuckle more or less takes care of itself, especially in winter. Maintain weekly waterings to keep the soil moist, as honeysuckle suffers in dry conditions, but use hand waterings only to supplement natural winter rainfall. The quick, aggressive growth of honeysuckle sometimes necessitates pruning, which is best done in winter, when the plant is at least semi-dormant. Use sharp pruning shears to cut back any dry or damaged wood, spent shoots or areas that are growing out of control. This winter pruning encourages spring blooming in many types of honeysuckle, and helps gardeners maintain control over the growth and shape of the plant. Flower and Garden Tips: Growing Honeysuckle, How Easy Is That?